3 Pack Survival Harpoon Knives and Sheath | BUDK.com - Knives & Swords At The Lowest Prices! Survive anything, at land or at sea, with these Survival Harpoons! 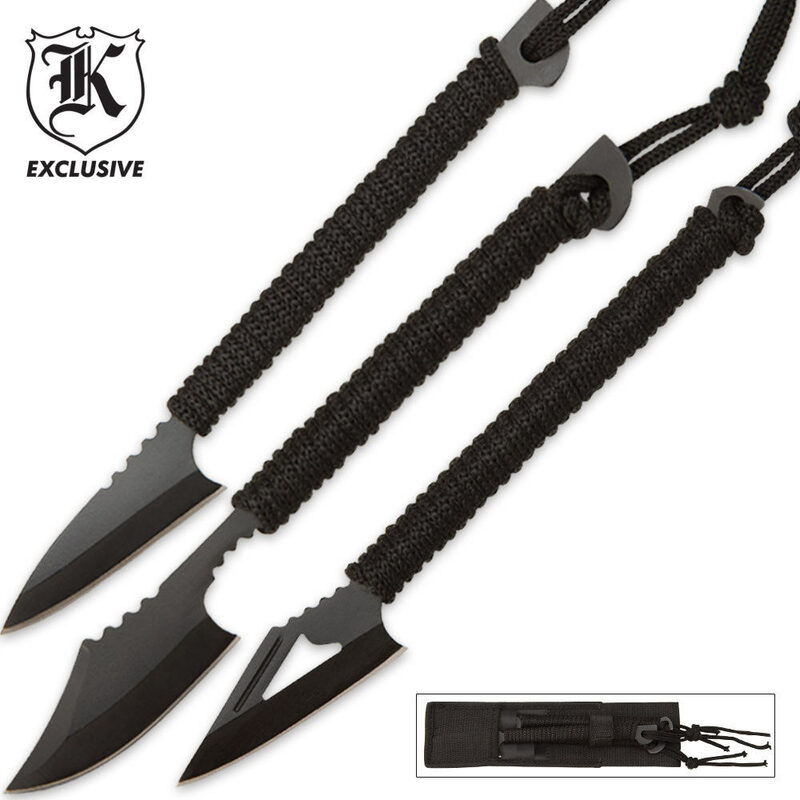 This triple knife set is constructed of AUS-6 stainless steel with a black-coating and features paracord wrapped handles. The paracord wrapped handles can be unwrapped and used as lashing to attach the point to a spear handle. Cool little shanks if you trim the excess cord but absolutely terrible throwers. Not sharp at all just a little smooth edge don't know what your suppose to hunt with that. I really thought that these were a good investment, they are solid, but they needed to be sharpened right out of the box. Which was no problem for me, however, i would prefer that you would revise the advertisement that they have para cord wrapped handles, when in fact it is polyester woven cord. Big difference. If you would like to continue to advertise them as having para cord wrapped handles pleas ask the people that you get them from to put real para cord on them? I bought these on a BOGO and free shipping deal (which made these practically give-aways) as a potential addition to our "Go Bags". First, the good points: These are surprisingly well made (including the very well designed sheath) and reasonably sharp (unlike some of the "razor sharp" butter knives being sold) and nicely sized. The bad news? They really are designed more for their aesthetic appeal than for their utility. This is what a "wannabe" thinks a survival blade might look like, rather than being real survival blades. That said, they are small enough and light enough and sturdy enough to warrant including at least one from the set in a "Go Bag" and, if you are willing to do a bit of grinding and reshaping, they can be made more functional. One wishes that, instead of turning out 3 vaguely "multi-purpose" blades, the maker had turned out a set which contained really useful exemplars for each anticipated need (a fishing harpoon, a skinning/gen'l purpose knife, a spear point, etc.). I'll repackage one blade from the set along with a small frog gig and stick that customized set in each of the family "Go Bags", but when it comes to edged weapons/tools, I'll continue to put my faith in my KaBar. This set of survival harpoons is great! It is so fun to use when your camping and overall a sweet deal. Very nice! I bought on a bogo sale and really like them and they are very handy!! For those who don't know how to mount, try using a wax wood staff with at least 1/2" to 3/4" diameter. One end, cut with circular saw approx. 5" directly in the center drill holes in side, slide harpoon in, bolt with regular nuts and bolts. Then wrap with para cord. This is by far my best work. Went fishing and landed 3 fish on 2nd day. Thanks BUDK. For a long time this item never got a second glance from me. Then one day it hit me while looking at the "BudK" catalog. Wow...the survival harpoon/knife could really be useful in a bugout bag/ survival bag, etc. Sence them I have ordered several to give to all members of my family. Here's two thumbs up BudK. Not worth buying. Not very sharp, uncomfortable, can't be thrown, hard to mount on a stick, sting falls off. Not many positives about these harpoons.